Place tees on a slight arc (either outside or inside the target line). 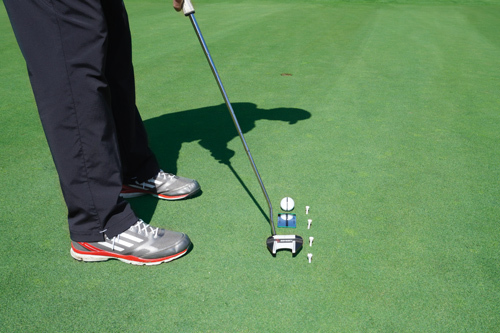 The change in arc for most golfers is between 1/8 and 1/16 of an inch every 3 inches depending on your stroke. Place tees 3 inches apart starting 1 inch outside ball and extend back and forward 9 inches. Stroke the ball and maintain your swing path arc back and through.